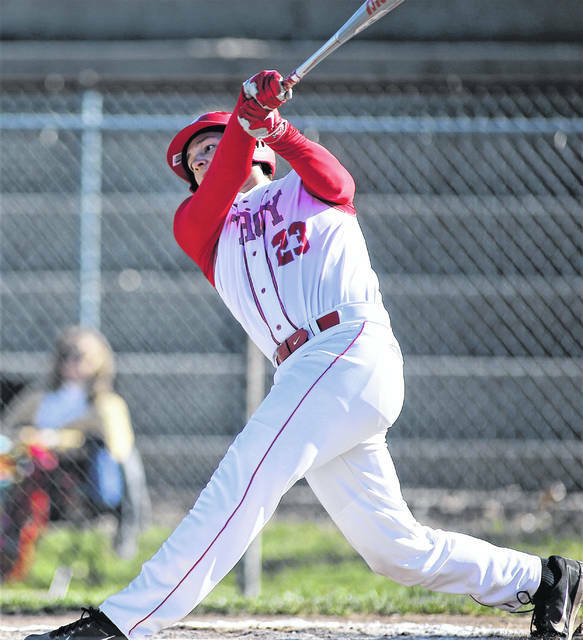 Lee Woolery|Miami Valley Today Troy’s Caleb Fogarty follows through on a first-inning double against Sidney Tuesday at Market Street Field. 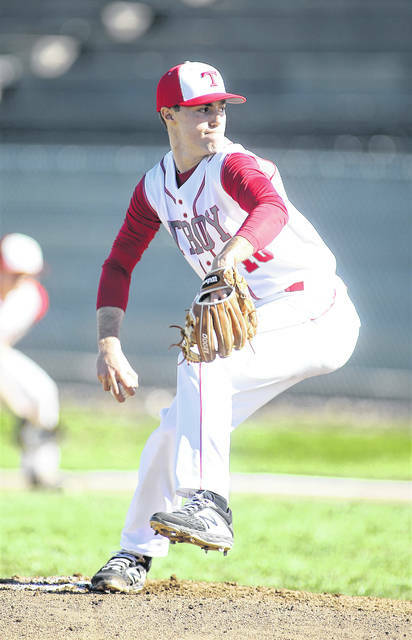 Lee Woolery|Miami Valley Today Troy starter Cole Brogan pitches Tuesday against Sidney. Lee Woolery|Miami Valley Today Troy’s Jacob Adams prepares to slide into third base Tuesday against Sidney. 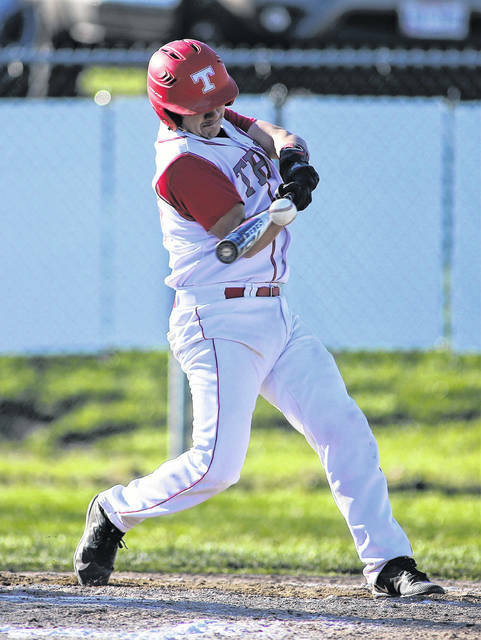 Lee Woolery|Miami Valley Today Troy’s Ethan West follows through on a hit Tuesday against Sidney. Lee Woolery|Miami Valley Today Troy’s Sam Shaneyfelt makes a catch in right field Tuesday against Sidney. Lee Woolery|Miami Valley Today Troy’s Weston Smith rounds third and heads for home Tuesday against Sidney. 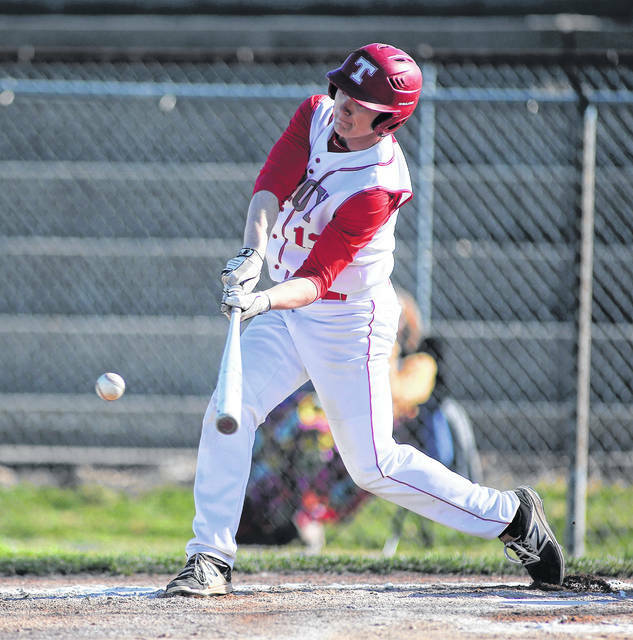 Lee Woolery|Miami Valley Today Troy’s Braeden Snider gets a first-inning hit Tuesday against Sidney. 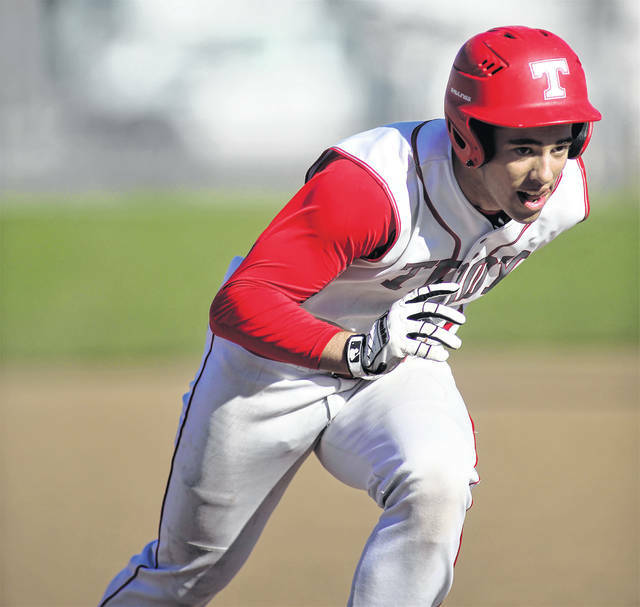 Lee Woolery|Miami Valley Today Troy’s Quentin Shepherd makes contact Tuesday against Sidney. Lee Woolery|Miami Valley Today Troy shortstop Austin Kendall tags out Sidney’s Caleb Harris attempting to steal second base Tuesday. 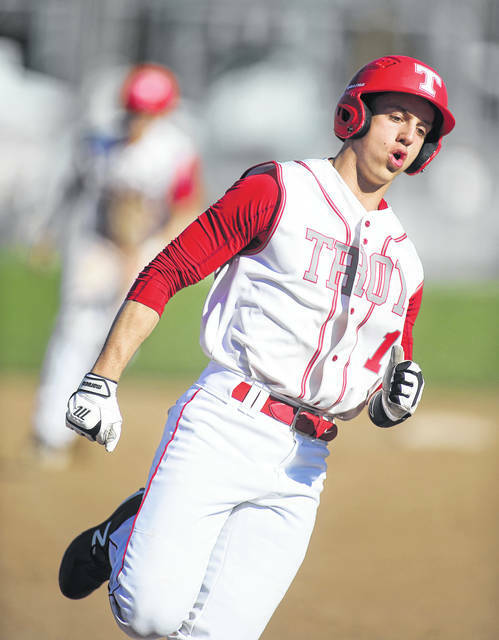 TROY — The Troy baseball team dealt with enough drama in Monday’s series opener at Sidney. With the win — Troy’s fifth straight — the Trojans improved to 7-1 overall and 4-1 in the GWOC American North, while Sidney fell to 3-7 and 1-5 in the division with its third consecutive loss. “Yeah, I’d say that (there was less drama today than the day before),” Troy coach Ty Welker said. Braeden Snider was 2 for 4 with a double and three RBIs to lead the Trojans — including the RBI double in the top of the seventh that scored Jacob Adams with the eventual winning run — and Austin Kendall was 1 for 3 with two runs scored as Troy only outhit Sidney 6-4 in the game. Matt Bigley pitched the seventh to earn a save, walking one — Trey Werntz, who stole both second and third base before a lineout ended the game. Ethan West started the game and pitched five innings of one-hit ball, striking out nine and walking four. Luke Severt pitched 2-3 of an inning and Nate Henderson got the final out of the sixth inning and was credited with the win in relief. For Sidney, Werntz was 2 for 3 in the game and Collin Jones had two RBIs. Darius Boeke took the loss in relief, allowing two hits and a walk while striking out one. Brogan walked and then Ethan West ripped an RBI single to left, then another double steal and a hit-batter loaded the bases. A wild pitch scored another run, and another walk sent Sidney making a call to the bullpen with the bases still loaded. Weston Smith was hit by a pitch to bring in one run and Kendall walked to bring in another, then Fogarty drove a two-run double over the center fielder’s head to make it an 8-0 game. Adams followed with a two-run single to make it 10-0 and advanced all the way to third base on the play to the plate, then Snider hit an RBI single to bring home Adams, and a walk and another hit-batter reloaded the bases, forcing Sidney to call on the bullpen again — still only with one out. Fogarty finished the game 3 for 3 with two doubles and four RBIs, Adams was 2 for 4 with three RBIs, Shaneyfelt was 2 for 3 with a double and two RBIs, Smith had two RBIs, Kendall and Snider were both 1 for 2 with two RBIs and West was 1 for 2 with an RBI. Overall, Troy outhit Sidney 10-2 and took advantage of a total of nine walks and four hit-batters. Overall, the series was similar to Troy’s first division series against Greenville last week. After another close Monday game — a disappointing 4-3 loss — the Trojans, behind Brogan’s pitching, run-ruled the Green Wave 15-0 the next day. The Trojans will get a tough test on the road Thursday at Springboro before taking on GWOC American South Division leader Xenia at home Friday. 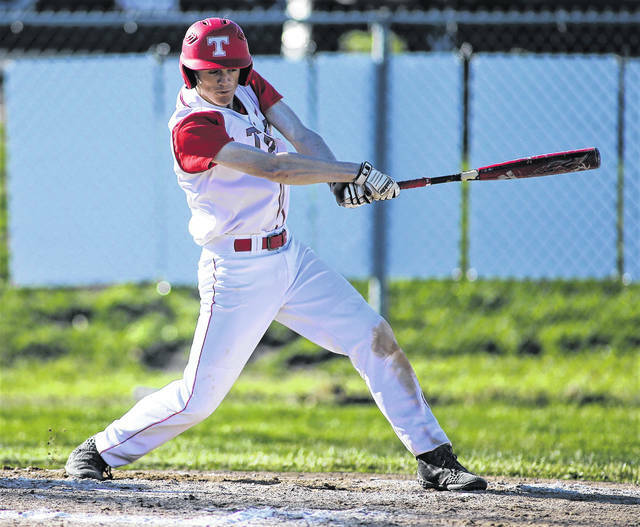 https://www.tdn-net.com/wp-content/uploads/sites/21/2019/04/web1_040919lw_troy_calebfogarty.jpgLee Woolery|Miami Valley Today Troy’s Caleb Fogarty follows through on a first-inning double against Sidney Tuesday at Market Street Field. https://www.tdn-net.com/wp-content/uploads/sites/21/2019/04/web1_040919lw_troy_colebrogan.jpgLee Woolery|Miami Valley Today Troy starter Cole Brogan pitches Tuesday against Sidney. https://www.tdn-net.com/wp-content/uploads/sites/21/2019/04/web1_040919lw_troy_jacobadams.jpgLee Woolery|Miami Valley Today Troy’s Jacob Adams prepares to slide into third base Tuesday against Sidney. https://www.tdn-net.com/wp-content/uploads/sites/21/2019/04/web1_040919lw_troy_ethanwest.jpgLee Woolery|Miami Valley Today Troy’s Ethan West follows through on a hit Tuesday against Sidney. https://www.tdn-net.com/wp-content/uploads/sites/21/2019/04/web1_040919lw_troy_samshaneyfelt.jpgLee Woolery|Miami Valley Today Troy’s Sam Shaneyfelt makes a catch in right field Tuesday against Sidney. https://www.tdn-net.com/wp-content/uploads/sites/21/2019/04/web1_040919lw_troy_westonsmith.jpgLee Woolery|Miami Valley Today Troy’s Weston Smith rounds third and heads for home Tuesday against Sidney. https://www.tdn-net.com/wp-content/uploads/sites/21/2019/04/web1_040919lw_troy_braedensnider.jpgLee Woolery|Miami Valley Today Troy’s Braeden Snider gets a first-inning hit Tuesday against Sidney. https://www.tdn-net.com/wp-content/uploads/sites/21/2019/04/web1_040919lw_troy_quentinshepherd.jpgLee Woolery|Miami Valley Today Troy’s Quentin Shepherd makes contact Tuesday against Sidney. 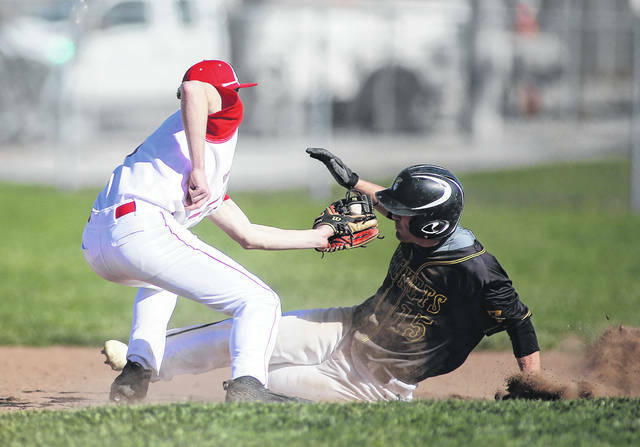 https://www.tdn-net.com/wp-content/uploads/sites/21/2019/04/web1_040919lw_troy_austinkendall.jpgLee Woolery|Miami Valley Today Troy shortstop Austin Kendall tags out Sidney’s Caleb Harris attempting to steal second base Tuesday.